Tada! I love this quilt. The second I bought Joelle Hoverson's beautiful book Last Minute Patchwork and Quilted Gifts, and first flipped through the pages, I fell in love with this quilt and knew that I had to make one for my own home. Soon after, I bought the kit and made the quilt top. I loved it every step of the way. The thing is, that was about 3 years ago! This quilt has laid in the shadows for the longest time, and for one good reason: Stella. The quilt in the book is designed to be a wall hanging. I made mine to fit a twin bed so I could put it on my day bed and have it be the star of the room. 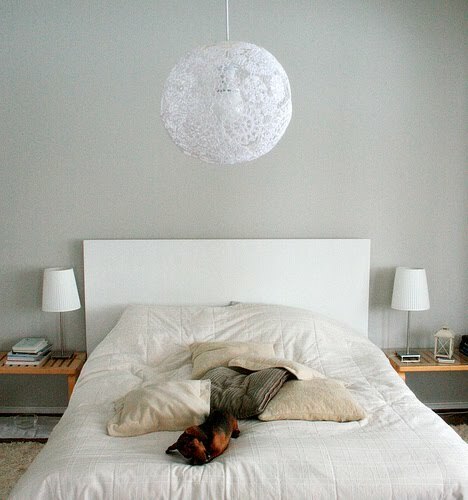 But then Stella came along, and she claimed the day bed. 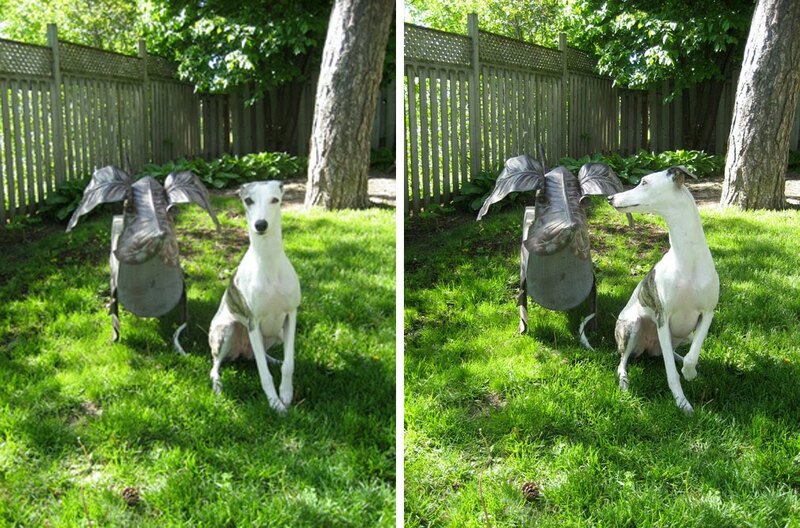 I wouldn't risk having my pretty, but often dirty-pawed dog muck up my crisp white quilt. When we bought the house I got giddy about the quilt again, I thought that finally I would be able to make up the day bed with it because we would be putting the day bed in a little bedroom upstairs and Stella would have no reason to hang out in there. Stella always sits wherever we're sitting. She likes to be close to us, finally, my quilt would have its moment. But apparently the damage has been done, Stella has some sort of unbreakable bond with the day bed. The other night after dinner instead of joining me on the sofa Stella marched straight upstairs and installed herself on the day bed for a bit of evening relaxation. I coudn't believe it! So, as a compromise I've decided to hang the quilt over the end of the bed. I've made up Stella's day bed with her other, less precious blankets, and the colourwheel quilt stands by at a safe distance. It sure did look pretty for that one day it was allowed to shine in all its glory as a bedspread! Maybe some day I'll lighten up a bit and accept the fact that quilts are meant to be used and so what if Stella messes it up a bit, it can be washed right? 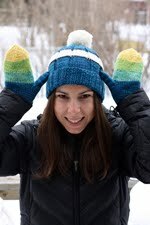 It's been way too long since I've blogged about any actual knitting I've been doing. The reason why is pretty simple, my knitting these days has not been particularly interesting. 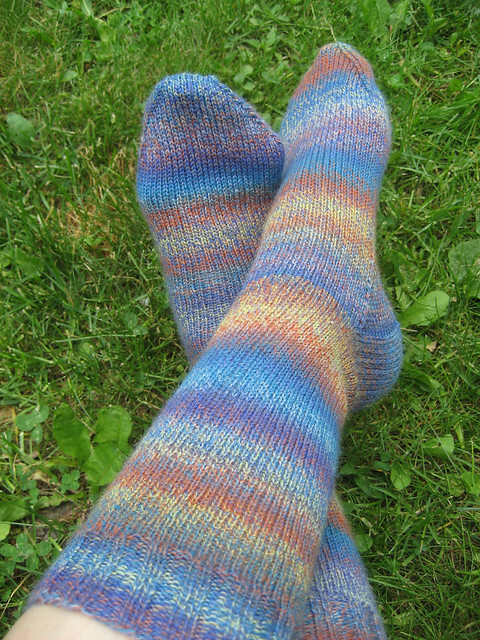 The other day I finished a plain pair of socks. They are lovely, comfortable, not exactly thrilling, but just fine. They will make a nice addition to my ever growing sock gift drawer. I am quite pleased to be able to take FO shots outside in my back yard now. If I wanted to do outdoor FO shots while living in my apartment I either had to plan a trip out to my parents house, or risk looking like a crazy person wearing shorts, a tank top and wool socks with no shoes, taking photos of my feet in the park... 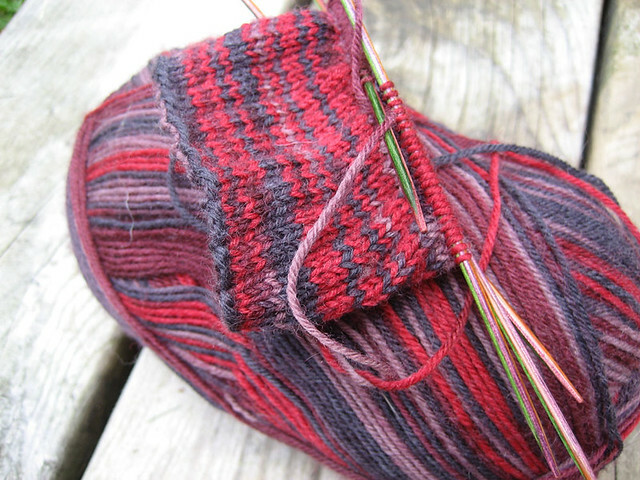 I have no problem knitting in public, but photographing socks in public is a bit trickier. And because I'm on a role I've started another pair of boring socks... I think that makes three in a row now! I've really upped the anti with this pair by working them on more stitches so they will be man-sized and doing them in a 3 x 1 rib. Exciting! I love my little garden. I hope to some day be an avid gardner, but for now I'm content to just admire the pretty little surprises that pop up in my garden every day. Since I don't really know what anything is, just about everything is a surprise! Chris and I were particularly curious about a big, fuzzy plant that was growing in the garden in the front of the house, I thought that maybe it was an out of control weed, but then this morning I walked out and looked at the garden and look at the beautiful blossom! It looks like it's made of tissue paper! So delicate and fine. And the bright orangey-red opens up to this dark, ebony center. Such a strange flower. But so beautiful. I have these in the back garden as well, and both front and back garden plants are loaded with buds that are all about to pop, I suspect I'll wake up one morning this week and all they will all be in full bloom! I finished a pair of socks last night, and I also have a couple of quilts to share, so I'll have some actual crafty content again soon. Stella, Chris and I are all adjusting very well to "life in the country". Technically, we're in the suburbs, but the yard, the parks, the trees, the garden and the silence all make it feel very much like a country retreat. We still don't believe that this is our new life. We feel like we're just playing house and we're going to have to give it all back at the end of the long weekend. We survived the move. Thank goodness for the help of friends and family! We were able to move just about everything we own for our home and business in one day, and we even got a head start on unpacking and organizing a few things. We have my mom to thank for that. I was ready to call it a day but she reminded me that we would feel so much better if we did just a little bit more sorting before bed and were able to wake up to a house in only a moderate state of chaos instead of a full blown mess. We've already gotten our hands good and dirty pulling weeds and planting a few blooms in the garden. We are definitely learning as we go. The other day I spent the afternoon weeding only to then walk through a nursery and spot several of the lovely species that I had just pulled out! Though things went smoothly, and we're all very happy to be in our new house, I am really looking forward to getting settled in our house for a nice, long time. No more moving for at least a couple of years now. Chris and I got the keys to our new house this week. We are officially homeowners and are officially loving it! We are very excited for this weekend when we will be fully moved in and can start fun homeowner jobs like pruning the hedges and planting the gardens. Stella loves it too. She has a yard with a fence and plenty of rooms filled with sunlight for her to bask in. This is the beginning of the next phase of our lives together and I couldn't be happier. I'm a little later than usual, but I couldn't let today go by without a TFA Tuesday post! 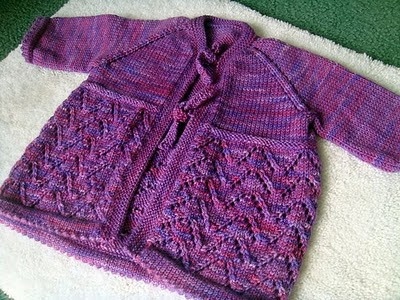 This week's TFA inspiration knit is by Viki (on Ravelry). She knit my Baby Shane Blanket with one of my kits in the Jewel tones colourway! 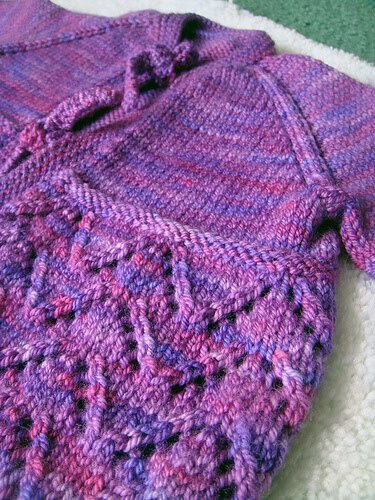 This is very exciting for me, because not only is it so fun for me to see things that others have knit in my yarn, but it is doubly exciting when said things were designed by me too! And her photography is beautiful, don't you think? Her project page for this blanket can be found here. When my mom knit this blanket from my kit, she used the leftovers in two ways, firstly, she enlarged the border, and secondly, she knit an adorable little roll-rimmed hat to go with it. Well, Viki did something similar, instead of enlarging the border, she actually made it a bit smaller by omitting a couple of the coloursways in it, and then she used that saved yarn to make a super cute pair of Baby Bell Bottoms. These must be just too cute on an actual baby. Can you imagine a snugly little one in these pants!? I love it! Here is a photo that my mom just sent me of me and my girlfriends at the wonderful surprise bridal shower that my best friend (and bridesmaid!) Sara through for me last weekend. Sara is on the left, she's a super talented painter, she gave me that cupcake painting I'm holding in the photo. I received lots of other beautiful and generous gifts, I'm sure I'll blog about them soon. Also pictured are Jenna of the fabulous Jenna Rose collection, and Jordana, photographer extraordinaire! We met during art school. Now that all the chaos of the Knitter's Frolic is over, Chris and I can spend our evenings packing up our apartment. It really is shocking to discover how much stuff we really have. And nothing illustrates that point better than moving! One very packed bookcase turned into about a dozen boxes of books. My "modest stash" of non-TFA yarn filled 3 large garbage bags! That one was a shocker, its actually kind of embarrassing. I may have to do a couple of blog giveaways to de-stash some of it! Stay tuned for that. At the end of the day, when we're done dyeing, labeling, packaging and shipping, and we've spent a bit of time packing, I sit down and hook away at these totally addictive little circles. My only rule for picking colours for these little guys is to try really hard to break out of my comfort zone. To not follow any rules! I am so used to really planning a project, picking colour palettes, working in a planned and well thought out manner, but this time I'm just flying by the seat of my pants. Sometimes making pretty circles that I really love, sometimes purposefully making ugly ones that don't make any sense to me, because when they are all tied together with the white border, they work together to look amazing. 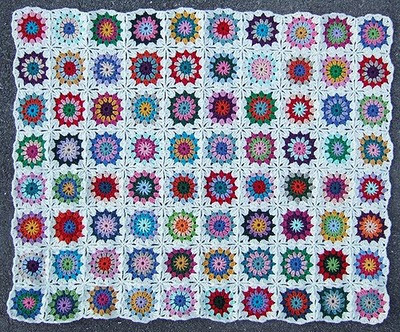 When I was a kid I can remember sitting at my grandmothers with my sister and looking at all the multicoloured granny squares in one of her afghans. Since Grammy's afghans were almost certainly stash busting projects the colour palettes were sometimes rather disjointed. Lilia and I would chose our favorites and point out our least favorites, its all part of the fun. I can remember often pointing out a particularly unattractive colour combo and saying: "why would anyone ever pair those colours together!?" and now I'm purposefully doing the same thing in my own afghan! Call me sentimental, but maybe some day I'll have grandkids of my own who will look at this afghan and point out their favorite squares and their least favorite squares, and I'll tell them that I did the same thing when I was their age. Grammy turned 92 years old yesterday! Happy birthday Grammy! The 2010 DKC Knitter's Frolic was a blast! I had big plans for this year, a double booth, a new yarn, five new colours... all very exciting. We brought a ton of yarn!!! We took all the back seats out of our rented van, except for one, after all, Lilia needed somewhere to sit, and then we stacked bags and bags of yarn until we couldn't stack anymore! We were pretty proud of ourselves. It was a big job. I wasn't convinced that it would all fit, but fit it did, though it was pretty tight! Chris had to stay home with the dogs (ours and my parents since dad was out of town) so Lilia came along to help with the heavy lifting, and to make it a true Lavallée girls weekend. We had a pretty good game plan, after all, this is our third show and each one is a huge learning experience, so we knew what we had to do. Set up was a bit of a chore, so many skeins to organize in rainbow formation, because really, is there any other way to organize yarn? After a couple hours of assembling shelves, unpacking yarn, stacking, hanging, draping and sorting, we were done! Besides the new yarn, there were two major additions to our show display this time, the standard, white ikea shelving units, perfect for yarn display, and the white peg board that we call "the wall of silk". Check out this awesome photo of it from cosmicpluto. Having the double booth allowed for much better flow, it was a lot less congested and people were able to walk around easily. All in all, we had a wonderful weekend! We stayed with family and took an extra day to make a trip to Hamilton for the afternoon to visit a friend (and bridesmaid!) of mine where I was surprised with a mother's day bridal shower. It was awesome, I was spoiled, I feel so lucky! 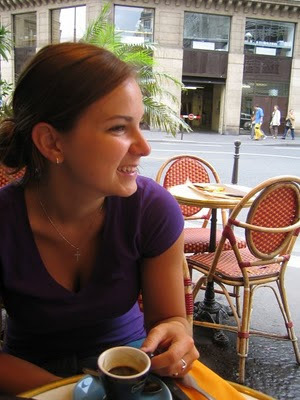 And to top it all off, my little sister Lilia found out that she has been accepted into McGill med school! Congrats Lilia! I never doubted that she would get in, but she was very happy to have it made official. The only down side is I expect she'll be a little too busy from now on to help me out at shows like this. I'm glad she was with us this time and got to witness first hand what this knitting madness is all about. A huge thanks to everyone who stopped by my booth to say hi and share your wonderful TFA knits with me. Getting to meet my customers in person is definitely my favorite thing about doing shows like this! We're back from the Frolic and we had a blast! I'll have a full detailed post of my wonderful weekend tomorrow, but today, its back to business as usual with a TFA Tuesday post. This week I've chosen to feature the beautiful new pullover design, Royale by Crazy Knitting Lady Glenna C. Not only is this pullover knit it TFA Green Label Aran weight yarn, but it is also a new addition to the Tanis Fiber arts by Glenna C pattern collection. I love it! This is knit in the Garnet colourway. 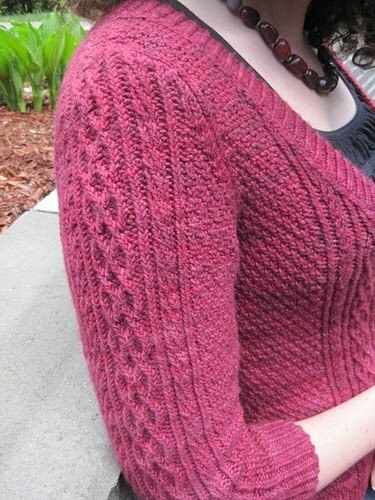 This sweater really demonstrates the versatility of tonal yarns. I think that people often assume that the slight variegation is too much for complex and intricate cables and that plain stockinette is all you can knit with tonals, but boy is that not the case! Look at all of those awesome little twisted stitches and cables! I think that not only does the tonal quality of the yarn not distract from the pattern, but rather it adds to it, giving the design extra depth and dynamism. The scooped neck, the flattering design, the clever construction, I'm smitten. This is another knit that proves that hand dyed yarn can be used to make very wearable, stylish and smart sweaters. Good job Glenna! Now to A) pick a colourway to knit my own Royal pullover in, and B) find a way to add more hours to the day so I can have the time to knit it! All I have left to do is pack some clothes into my weekend bag and I'm officially all ready to go to the Frolic! 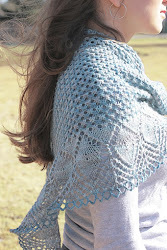 We've updated the website with new patterns, colours and yarns. We've spent weeks, maybe even months planning and dyeing and generally preparing for this weekend. We've got bags and bags (and bags!) of yarn to cram into the van we're picking up tonight. And now all we can do is cross our fingers and hope that all goes well and that we haven't forgotten anything! 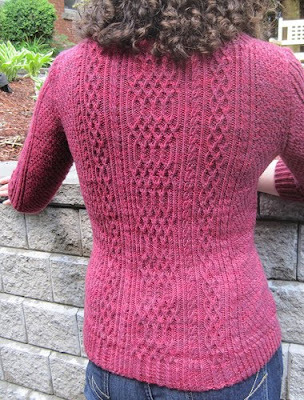 I am very excited to see in person the new pullover design that Glenna has done for me. I've gotten to see snippets of it in photos as she was working on it and the Royale Pullover has looked awesome every step of the way. Now that it's ready for prime time I am beside myself excited about how awesome it looks! Modern, fitted, fashion forward, a real wearable and stylish piece of impressive knitting. Come by my booth and visit this stunning sweater (along with other awesome samples) on Saturday. I'll be away from my computer all weekend, so there won't be any blog updates, but I'll be back early next week with a full recap of my Frolic experience! And..... here is some crochet! I can't stop. I'm making a blanket. I plan on making about a hundred more of these little circles in squares..... wish me luck! 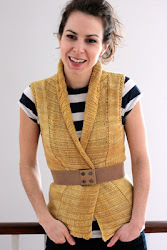 This week's TFA Tuesday knit is by Dear Knit's (blog, ravelry id). Voila the Helena cardigan knit in TFA Yellow Label DK weight yarn in the Jewel colourway. I've always thought that this pattern was super cute for a little girl. 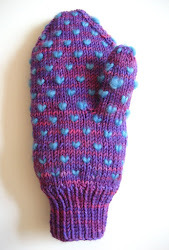 I've also always loved this colourway and thought that it was perfect for a little girl too! So, put the 2 together and its magic! If a little girl can't wear a lacy cardigan knit in a bright pink/purple shade, than who can!? I've always felt that baby knits aren't exclusively reserved for pastels. With the leftover yarn DearKnits made a matching hat (project page). I love the little bow on the top. The next time I have a little girl in my life that needs a sweater I know exactly what pattern and yarn I'm going to reach for. Because I don't want to be a one trick pony I decided to try and crochet a circle. Following the instructions for the blanket I showed yesterday (found here) I made these little numbers. I don't think I can stop. 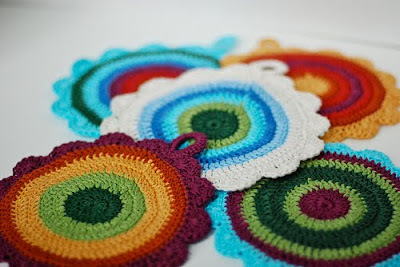 I have no immediate plans for these circles, but I know that I'll be making more tonight! For a while now I've wanted to learn how to crochet. I think that I've mentioned it here before on the blog. When I've asked my mom to teach me she's always said to just pick up a book or go online and I'd figure it out myself quick enough. So... that's what I've decided to do. Here are some of the items that put me over the top and made me steal 5 crochet hooks from my mom yesterday. And good ol' pot holders. 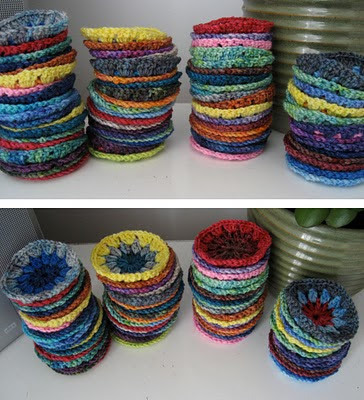 There are tons of great examples of crocheted pot holders out there. I'm thinking that these would be a great way to learn, bright colours, small scale, perfect. I love these from through the loops (ravelry link). 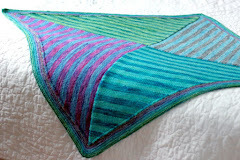 The super popular ripple blanket. 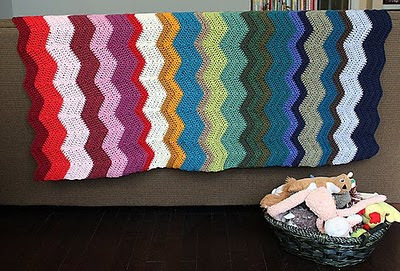 Another crochet project that has flooded the blogosphere lately, I particularly like the way that this one mixes up the width of the stripes, (ravelry link) plus, we all know I'm a sucker for colours lined up in rainbow order. 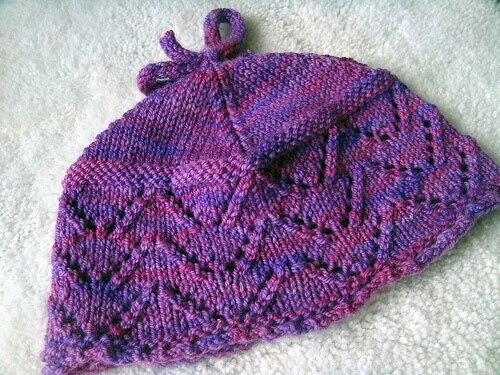 And lastly, I am in awe of this peice (ravelry link). This is definitely a project that I hope to tackle myself one of these days. I may take a bit of an easy way out and try and buy a bunch of vintage white doilies for my version, rather than crochet them all, but who knows, I may feel up to the challenge if I get the hang of crocheting. Isn't it awesome!? I haven't quite mastered the fine art of crochet yet... but I have made two granny squares! They are far from perfect, I'm having tension issues and I think that I may be doing it backwards... or at least what I was thinking of as the back seems to look much better than my front, so I may have a problem there. A few more trials and a many more errors and I'll be off to the races! the countdown to the Frolic is on! This year, we are upping the ante with a double booth! Twice as much space! I have twice as much stuff... so it makes sense, but mainly, I wanted to give the shoppers (and us!) a bit more breathing room, things got very crowded, very quickly in our little booth last year, so this year I hope to have a more spacious feel. Last year, pretty much all I had at the show were my 4 superwash merino yarns. So much can happen in a year, now I have the silk yarn, 2 roving's (superwash merino and silk) 3 kits and a new fabulous cashmere sock yarn which will be making it's debut next weekend. Not only will my booth be twice the size (and contain twice as much stuff!) but I'll also have proper shelving and (hopefully) clearer display, it should all look a little more professional. I am really looking forward to it all, and trust me, I'll have tons of photos to share with you when I get back. I'm also bringing 5 new colourways to the show: Cobalt, Teal, Velvet, Poppy and Sunset. They will be available on the website next weekend for those of you poor souls who can't travel to Toronto to attend the show. I am loving these colours. I've already knit with Velvet and have plans to bring Teal or Cobalt with me as a traveling sock project for the road to Toronto. These new colours will be available in all my yarn bases. Hope you like them! Another new addition to my booth at the show is my sister Lilia! Lilia will be helping us out this year and I can't wait for her to see first hand what we've been talking about. Lilia is also a knitter, so she's going to be a big help! Well, now I'm off to finish putting together kits and continue labeling skeins... we're almost ready for the Frolic and I just can't wait! Hope to see many of you there!